Step off the beaten path and head to Ounasvaaran Hiihtokeskus Oy and Auttikongas. Visiting Safaris and Poro Farmi will get you outdoors. Get out of town with these interesting Rovaniemi side-trips: Korouoma Canyon (in Posio) and Kemi (Kemi Church & Sampo Icebreaker). The adventure continues: find something for the whole family at Santa Claus Village, see the interesting displays at Santa's House of Snowmobiles, get engrossed in the history at Arktikum, and stroll the grounds of German Soldier s Cemetery. To see photos and other tourist information, refer to the Rovaniemi trip itinerary planning app . Helsinki to Rovaniemi is an approximately 4-hour flight. You can also do a combination of flight and train; or drive. In March, Rovaniemi is slightly colder than Helsinki - with highs of -1°C and lows of -9°C. Cap off your sightseeing on the 11th (Mon) early enough to go by car to Luosto. Get in touch with nature at Kopara Reindeer Park and Pyhatunturi. Discover out-of-the-way places like Pyha-Luosto National Park and Amethyst Mine Lapland. Explore the numerous day-trip ideas around Luosto: Sodankyla (Museum - Gallery Alariesto & Church of Sodankyla). For where to stay, traveler tips, other places to visit, and more tourist information, read our Luosto trip planner . Traveling by car from Rovaniemi to Luosto takes 1.5 hours. Alternatively, you can take a bus. Traveling from Rovaniemi in March, you can expect nighttime temperatures to be a bit cooler in Luosto, with lows of -13°C. Finish up your sightseeing early on the 15th (Fri) so you can travel to Salla. 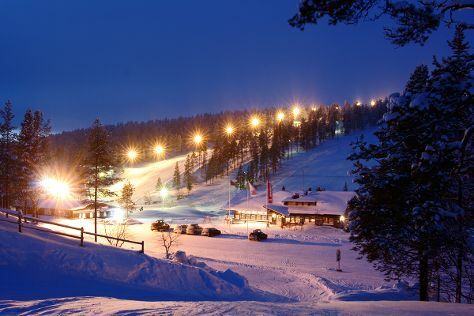 Salla is a municipality of Finland, located in Lapland. 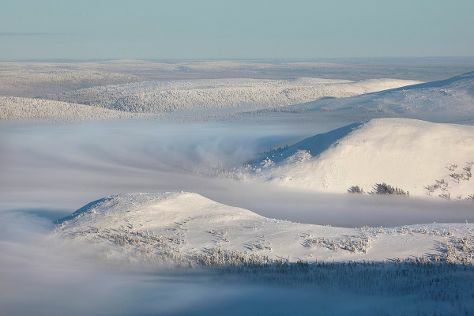 Escape the urban bustle at Salla Ski Resort and Riisitunturi National Park. Discover out-of-the-way places like Salla Museum of War & Reconstruction and Ski Resort Suomutunturi. Planning Salla trip won't be overwheling when you use's Insprock itinerary maker. Drive from Luosto to Salla in 2 hours. In March, daily temperatures in Salla can reach -1°C, while at night they dip to -13°C. Finish your sightseeing early on the 18th (Mon) so you can travel to Saariselka. 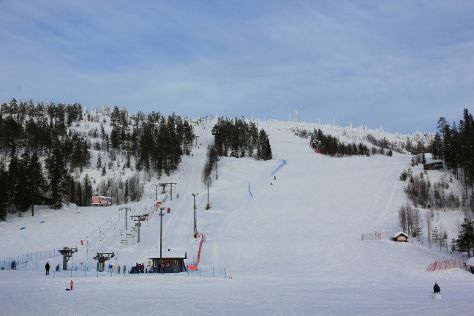 Visiting Urho Kekkonen National Park and Saariselka Ski & Sport Resort will get you outdoors. You'll explore the less-touristy side of things at Nature & Wildlife Tours and Lake Inari. You'll find plenty of places to visit near Saariselka: Inari (Inari Reindeerfarm & Saint Tryphon Pechenga Orthodox Church). To see ratings, other places to visit, maps, and other tourist information, read our Saariselka visit planner. You can drive from Salla to Saariselka in 3.5 hours. In March, daytime highs in Saariselka are -1°C, while nighttime lows are -12°C. Finish up your sightseeing early on the 22nd (Fri) so you can travel to Muonio. Muonio is a municipality of Finland.The town is located in far northern Finland above the Arctic Circle on the country's western border, within the area of the former Lappi province. Explore hidden gems such as Pallas-Yllastunturi National Park and Keimiotunturi Fell. Escape the urban bustle at Yllas Ski Resort and Pakasaivo. When in Muonio, make a side trip to see Konijanka Petting Zoo in Akaslompolo, approximately 46 minutes away. The adventure continues: glide through natural beauty at Torassieppi Reindeer Farm & Cottages, examine the collection at Muonion Kotiseutumuseo, and contemplate the long history of Keimioniemi Fishing Cabins. To find more things to do, ratings, and more tourist information, read our Muonio road trip planning website . You can drive from Saariselka to Muonio in 3.5 hours. Expect a daytime high around -1°C in March, and nighttime lows around -12°C. Finish your sightseeing early on the 26th (Tue) to allow enough time to travel to Kittila. Kittilä is a municipality of Finland and a popular holiday resort.It is located in northern Finland north of the Arctic Circle within the Lapland region. Eschew the tourist crowds and head to Seven Fells Up and Kid's Land. Get outdoors at Safaris and Levi Ski Resort. When in Kittila, make a side trip to see Scandinavian Adventures in Akaslompolo, approximately 44 minutes away. There's still lots to do: gear up at Elan Ski Shop & Rental, don't miss a visit to LUVATTUMAA - Levi Ice Gallery, identify plant and animal life at Santa"s Cottage & Pet Farm, and admire all the interesting features of Ice Karting Levi. To see ratings, where to stay, maps, and tourist information, use the Kittila day trip planner. You can drive from Muonio to Kittila in an hour. March in Kittila sees daily highs of 0°C and lows of -10°C at night. Wrap up your sightseeing by early afternoon on the 31st (Sun) to allow enough time to travel back home.